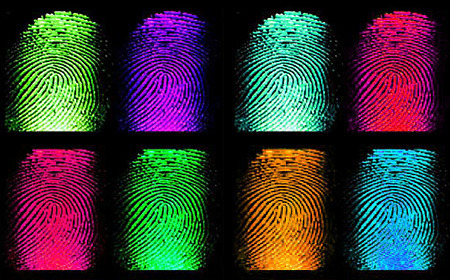 Here you will find our latest web design, email and internet security related articles. Take your time to post a comment / question and rate topics that you find interesting. 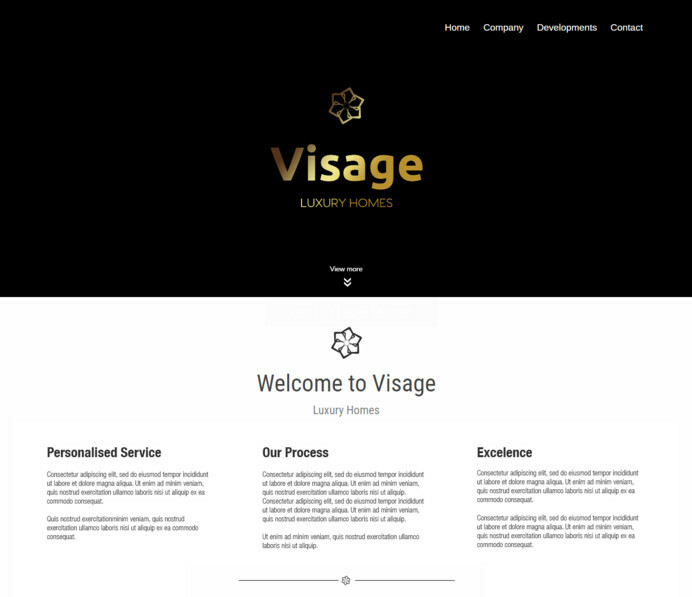 Visage Luxury Homes is a real estate developer building luxury properties Marbella and other areas in Costa del Sol. We were instructed to develop an easy-to-use website with minimum number of pages and our exclusive web design where their developments would be listed on the home page. For this we have implemented a scrolling layout - developments menu item automatically scrolls to property listings on website home page. Property development listings are powered by Real Estate Software designed by our team which was customized to accommodate extra fields and services according to client requirements. Each property features its photo gallery with full screen dynamic preview, PDF download area, automatic Google Maps, Youtube Video and 360 degree view integration - all optimized for mobile and high-resolution retina screens. We have finished developing our new Real Estate Engine which provides property area on Wordpress administrator where one can easily add properties, new locations, manage photos and property plan PDFs for each property. Software provides integration with Resales Online and Infocasa real estate networks. Our real estate engine is designed to be SEO friendly and easy to use. 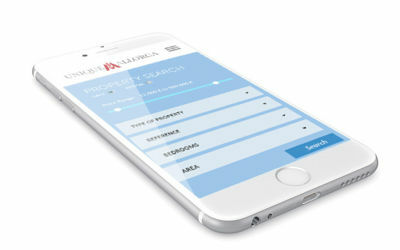 On website it provides property search with range selectors compatible with mobile touch screens and custom dropdowns, as well as property listings and individual property pages displaying all real estate features and an automated Google Map of the area. Software is optimized for high performance designed to handle busy multilingual websites with thousands of properties. We were requested to develop a large real estate website with both exclusive properties managed by our Wordpress Real Estate Software and Resales Online property database integrated into a single SEO friendly property search system. Sbai Concept real estate website features our exclusive web and logo design. 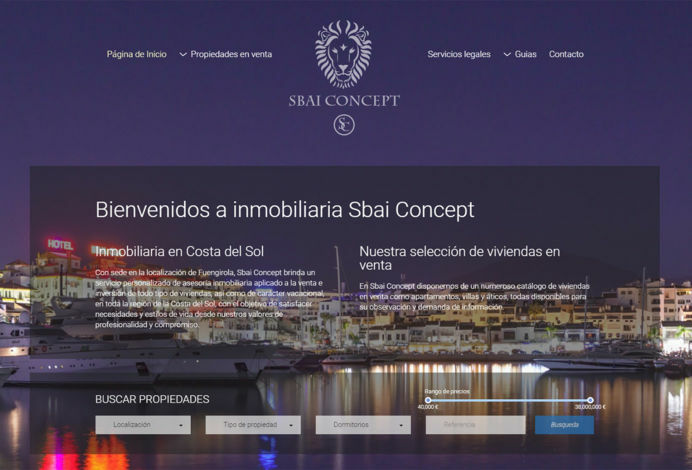 With over 20.000 real estate properties for sale in Costa del Sol website works lighting fast due to our optimized PHP 7 development and a proprietary caching engine. 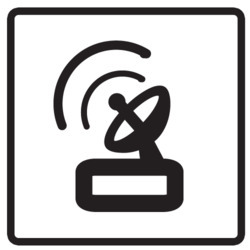 Site features property listings pages for each area which are optimized for search engines, semitransparent real estate search panel, custom dropdowns, logarithmic price range selector with touch screen support, optimizations for mobiles and tablets as well as HD photo delivery for retina displays. 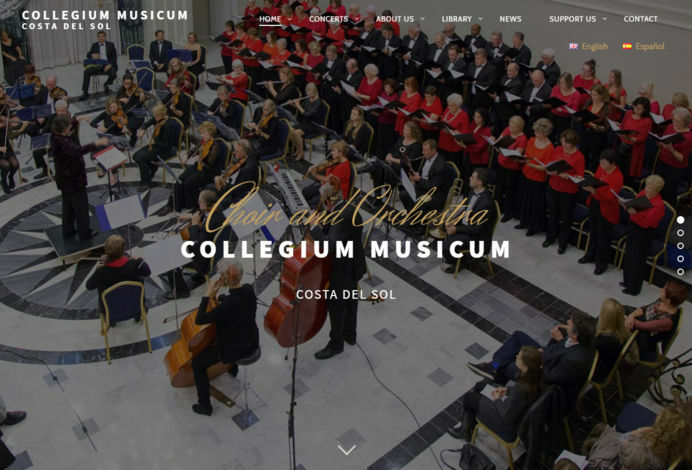 We have just released a new Wordpress based website developed for Colegium Musicum - Classical music choir and orchestra situtated here in Costa del Sol. Available in both English and Spanish Collegium Musicum website features many different mobile friendly content layouts, beautiful photo galleries with full screen preview, blog, concert section, download area and much more. Website is using latest web development techniques, its sections are joined into large pages separated by full screen photos with parallax photo effect and scrolling text animations. 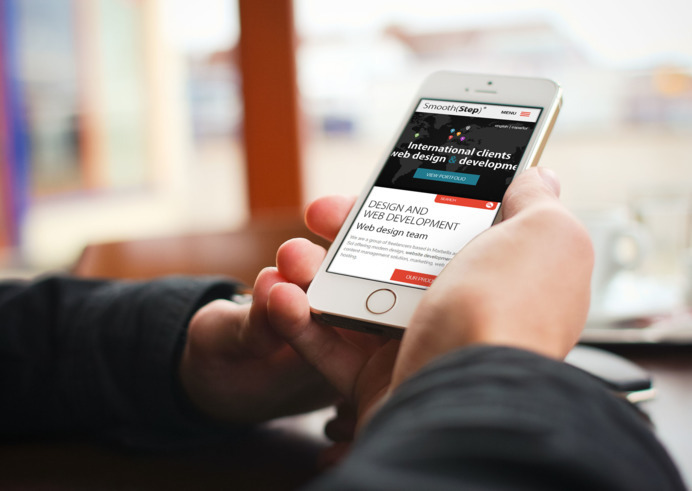 We were instructed to use a different, more visual approach developing this website. Its design is based on semitransparent panels over a static full screen photo of their property resort. We have also designed high end PDF brochures for each of their available villas. Having been provided with many HD photos we have designed beautiful pages for each villa with expandable slideshows and a full screen photo preview optimized for retina screens. Site also features a customized location map, interactive villa highlighter, agent registration with administrator approval and a restricted download area with PDF generator which automatically adds agent logo and details to downloaded PDFs. 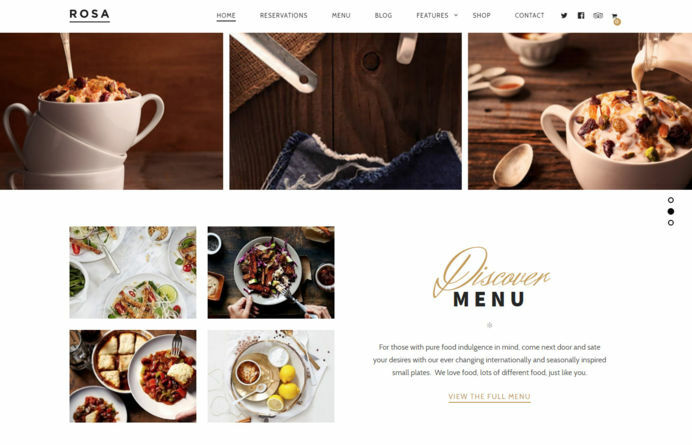 Restaurant websites require unique services for to manage table reservation, food menu and order delivery management. We would like to offer quality Rosa bar & restaurant website template with clean mobile friendly design and restaurant services managed using Wordpress content manager. This theme can be customized/redesigned to fit the needs of any restaurant or bar. Lawyer websites generally contain many pages of content explaining all their services, opening office hours, team section, testimonials, case studies and question/answer service. 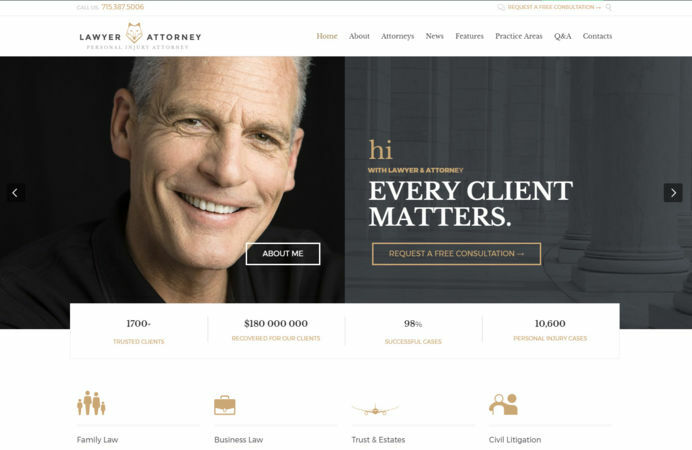 Lawyers and Attorney website theme handles all these services with Wordpress administrator, it also offers a clean responsive design which can be customized by our web design team. Apart of offering web design based on our own real estate manager and our exclusive design we also build cost efficient real estate sites based on predesigned templates. 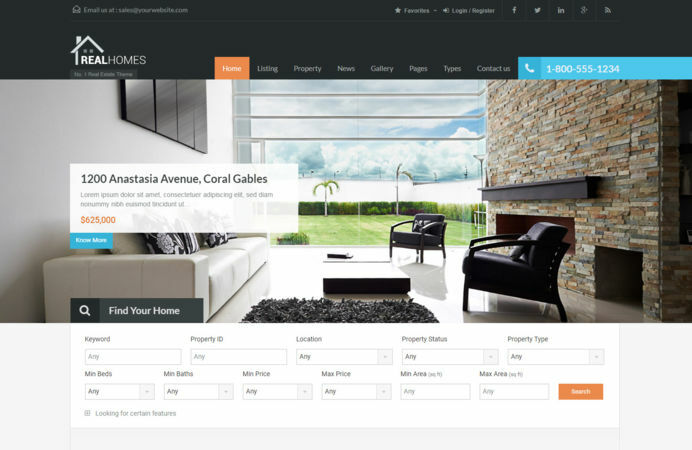 Real Homes property website template offers highly customizable property manager paced with many useful real estate features including property search and individual property pages, client account registration as well as accounts for property owners where they can publish their properties. 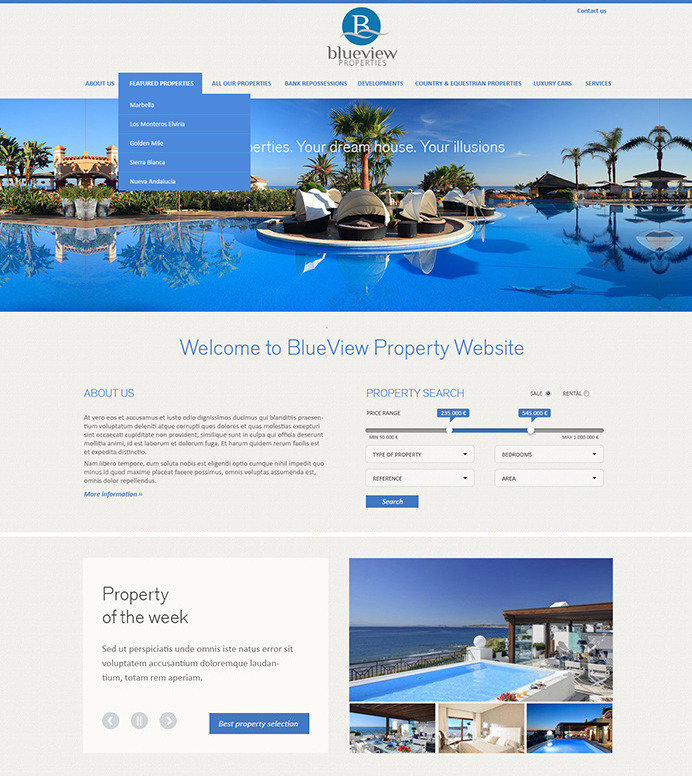 As an alternative we also suggest WP-Real Estate 7 theme. Prestashop is a powerful e-commerce manager with administration section where one can add products, their categories and features, manage stock, client accounts as well as website menu and content. 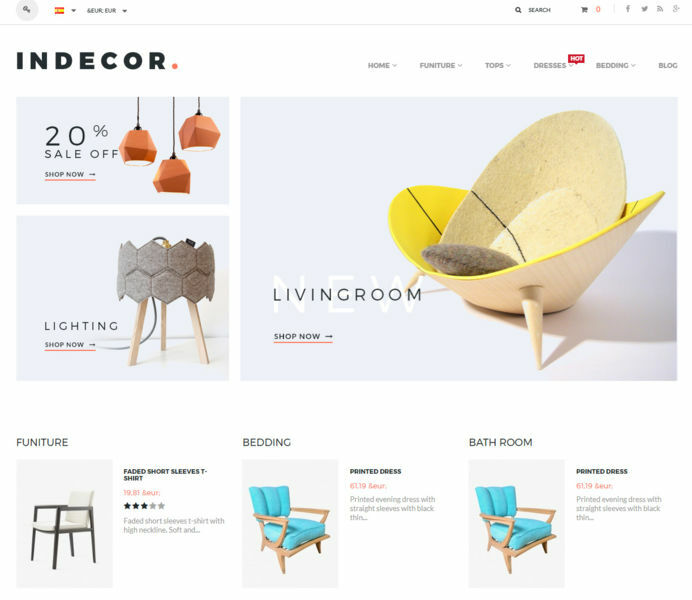 For interior decoration and furniture shops we offer Indecor e-commerce website template specially designed to handle a furniture related website. If offers a responsive design, featured products on the home page, clean product listings with product ratings, payment system and everything else needed to start an e-commerce business. This template design can be improved installing full screen photo slideshow on home page with transparent menu over it, redesigning sub-menus and product listings implementing expandable product search above product listings. Fashion and clothing shops usually require clean design with large high quality photos. To offer cost efficient e-commerce solutions we suggest Leka and Panda clothing shop templates which can be improved and customized by our web design team. Main improvement for these e-commerce themes would be to redesign product listings so they would expand to full width of the screen placing search above the listings, we can also redesign website menu, footer and all other parts. We have rolled up a new service offering website security services in response of having several requests to cleanup corrupted sites. When performing the cleanup works we were able to determine that all of them were infected due to outdated open source content management software such as Wordpress, Prestashop or one of their free plugins. Open source means that the source code of the manager is available to the public therefore whenever new update becomes available with documented security fixes – all sites sites having outdated software version become in risk of being compromised. 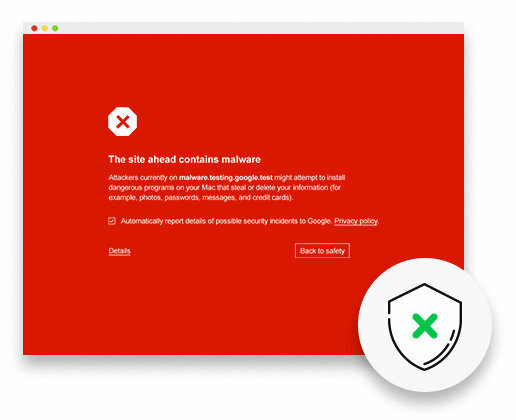 We offer both managed website security updates and compromised website cleanup services, as well as spam protection for contact forms, SHA password protection and SSL encryption for sensitive data communications. We have finished responsive design implementations for our development site, now it is fully compatible with all phone and tablet resolutions. The site programmed to automatically adapt to detected mobile or tablet screen loading mobile menu and responsive panel design versions so everything would look good on detected resolution. Recently we got quite a few requests from various clients to optimize their websites for mobile and tablet support. Since different mobile and tablet devices have different screen resolutions we have implemented a HTML technique called Liquid Design where website design automatically expands to the available screen size providing best accessibility to all devices. We would like to present two of our best recent works. IMS Mortgages large content driven website and complex Unique Mallorca real estate where we have implemented custom mobile friendly dropdown selectors, visual price range selectors, restricted area and much more. Please visit our mobile optimization page by clicking on the link below and try the sites on your mobile device. 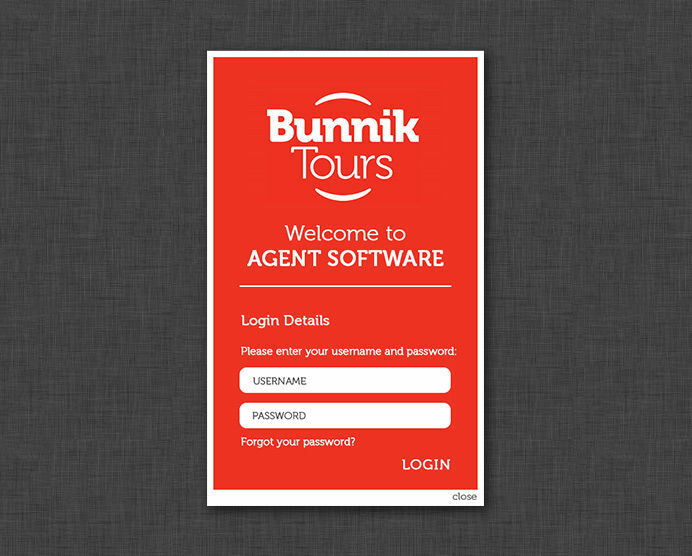 Our company has developed state of the art web software for an australian BunnikTours travel agency. The application is based on dynamic windows that opens on top of their main site. The software is based on JSON technology which means that the software is actually loaded from our server allowing cost efficient development since the client doesn’t have to buy our framework and libraries. This web application has been specifically designed by our team to combat spam that arrives from website forms. The plugin is compatible with Smooth Step CMS and Wordpress content managers. The system has been designed thinking about website visitors since we have received suggestions from several clients that they have a hard time reading and entering the code on other sites where such technology is implemented. These seem to have too many letters and the letters are too mangled. Having this in mind we have created a simple 4 letter code that can be read easily. This huge educational website has been developed on Wordpress content manager using our custom plugins. Large part of website content has been imported from the old website; we had to develop the importers. This generates over 3000 unique pages for search engines. 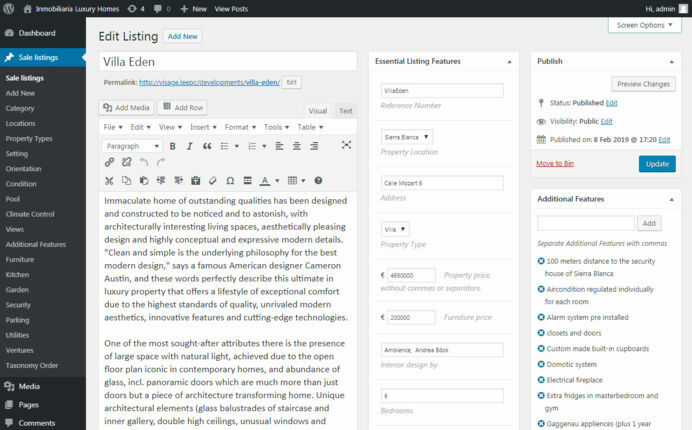 Smooth Step content manager is no match to Wordpress or other open source solutions where complex content layout is involved. This high quality transportation website has been produced using content in mixed columns, a feature that is easily handled with our manager. 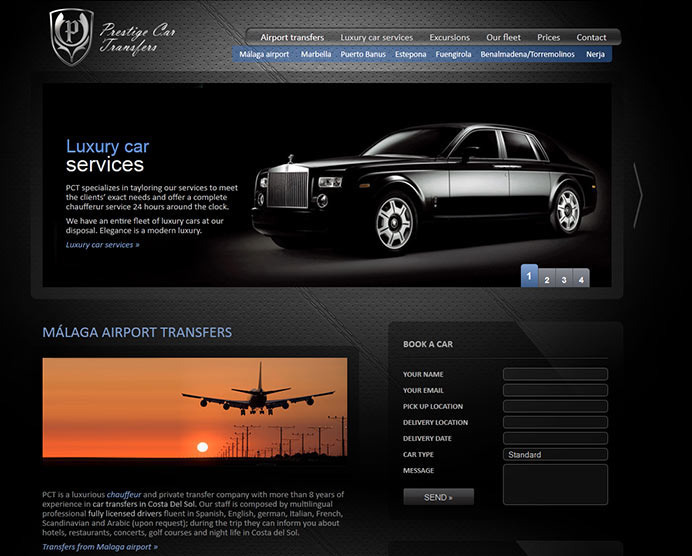 The website is very successful generating many airport transfer requests due to our elegant design and SEO services. This elegant real estate website has been designed having functionality in mind. For quick access to property listings the search is clearly visible on the home page. To ease the search a range selector has been implemented to select a price range without the need of entering the numbers manually/ Real estate listing pages are equipped with a horizontal version of the search panel that can be readjusted to perform further searches without having to click back button on the browser. Website header has a full screen slideshow that readjusts itself depending on the screen size. The slideshow appears wider on the home page and thinner on all other pages for better access to the content. Website home page comes with featured property slideshow that displays selected featured properties with their photos, features and descriptions. Each property page also features photo slideshow designed to display full size images adjusted to client screen size. 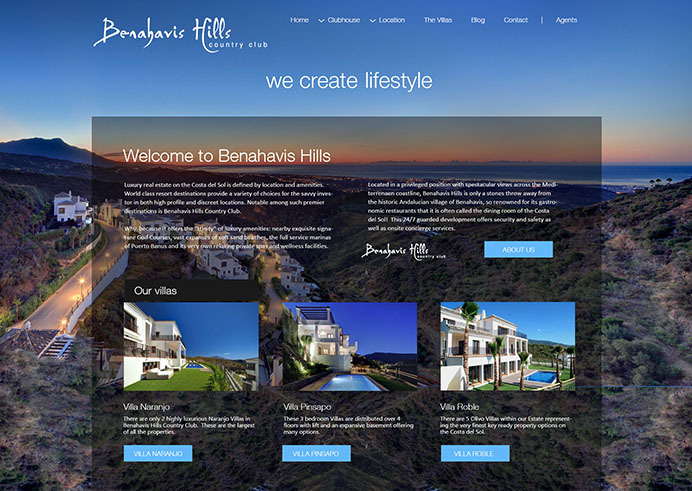 The site has been developed on Wordpress content manager connected with our new Real Estate Management Software. The tool provides cutting edge tools for an easy property listing. Property photos can be uploaded in any size, the system will resize them to the required sizes automatically. Multiple photos can be selected for upload, once uploaded they can be rearranged visually by dragging the thumbnails to the desired position. The system also allows quickly choosing property features from the ones used on other properties as well as adding a new feature on the fly. A large real estate website project we have been developing during the recent months for an agency in Mallorca to replace their old website. The website is built using our Wordpress based SEO friendly Real Estate software. In this project we have implemented our latest technologies in both visual interface and server programming. Highly optimized, the website handles over 3000 properties in 3 languages each with many high definition photos. The properties are daily updated from their internal real estate manager using our XML feed importer. Website has many advanced features such as free registration for visitors that unlock their personal real estate shortlist, online support, dynamic visitor graphs for each property, PDF integration, AJAX based features such as contact form validation, visitor graphs, chat and shortlist management. Working with photo retouch, video editing and post production for various projects we have developed various custom artistic image filtering techniques. After reviewing large amount of saved filters and recorded footage our team has decided to release Sky Jazz artistic video and a new site focused on photo retouch, filming and post production. Dynamic web development opens possibilities to build highly automated websites that can be easily managed using content and product management software while static ones are simply a bunch of HTML documents on the server. Without any administration static sites give little benefit to site owner as websites that provide interactivity and fresh content tend to rank better. Article comments main benefits that can be achieved using dynamic development approach. We have been looking at our old site for a long time writing a list of what could be made better. After a while the list got so long that we have decided to go for complete redesign. Several new things have been implemented these include: tag cloud with results ordered by relevancy, product section, dynamic slideshows and others. Here we will try to present first steps one should take to analyze web application performance. This is very important as it is a basic foundation on which other actions are based. We will stress here on monitoring the behavior of web application as it is vital to understand how it works. Chapter comments how to improve web application and overal website performance using server side caching. Here we talk about several caching models with their pros and cons and examples, also where they have been used on Smooth Step CMS. Static URLs are very important to achieve best possible search engine positioning and to increase web site performance. Article comments main difference between static and dynamic page names (URLs) and how to convert them using URL rewriting technology. Free major web browsers to choose; their advantages, security and supported operating systems. Make sure that you are using latest version of your web browser installed, especially if you are still using Internet Explorer 6 as it has serious security and rendering flaws. Computer viruses tend to slow down computer's performance and damage file system. In this chapter you will find free antivirus software to protect your computer. Email service is often abused because of its democratic nature. When user publishes email address as text on the website it takes only a few days for pharmaceutical, scam or other type of email spam to arrive. This chapter is about security on the internet - Fraudulent software and vulnerable web browsing applications. You will also find information about free antivirus and antispyware software, firewalls and useful protection tips for safer internet usage. It is important to know how web browsers work to use website information and services effectively. Here we have commented several basic web browser features for those who are not yet familiar. 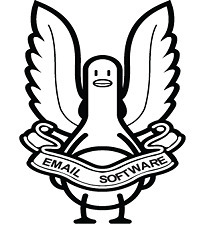 Email software is a computer program designed to manage electronic mail. Unlike web mail service, email software is capable of handling multiple email accounts; what can be very useful for business internet users. Web based e-mail service is very helpful for those who need free email account that is easily accessible from the internet by using web browser. Here you will find major free email providers, also their pros and cons compared to business email service. Here you will find our frequently updated topics. Take your time to share your thoughts by posting a comment on a topic you find interesting. If you have a high quality article related to one of our topics, contact us and we will consider to place it on this blog. Check other Smooth Step articles related to web design, servers and SEO. Client usually updates site's content using content management system and we take care of the rest: Smooth Step web hosting service is also available as a separate package (without our web design).